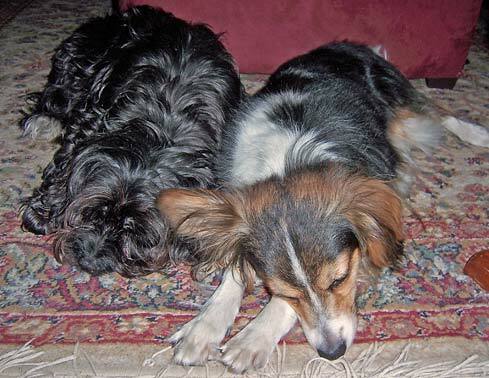 Buddies: Tate, right, really loves his new "brother," Jake, left. On Tuesday of this week we met with Dr. Steven Rousey at Minnesota Oncology and Hematology PA (MOHPA) in Edina. Because Coni is receiving her treatment in Maryland, she has not been consulting with a local oncologist. The doctors at NIH recommended we find a local oncologist to consult with as needed, particularly if Coni's participation in the NIH protocol comes to an end. Coni was referred to Dr. Rousey through an online support group for adrenal cortical carcinoma patients. He has experience treating a few ACC patients in the past. Doctors with this type of experience are hard to find since it such a rare form of cancer. Coni and I were both impressed with Dr. Rousey. He seems to be very caring and positive, and was very knowledgeable about ACC and its treatments. He gave us information on a number of potential treatment options Coni can try as she moves forward, which gives us a lot of hope that even if we don't get better results at NIH than we have gotten thus far, we are far from the end of the road as far as treatment options. Coni and I will be returning to NIH again next week to find out if the increased dose of chemotherapy has been successful in shrinking her remaining spots of cancer. We will keep everyone posted as to what we find out. In the meantime, you can follow this link for more information on Dr. Rousey and MOHPA. I received my Bulletin, today, and it looks like I missed your birthday! I apologize, and wish you a very happy, belated, birthday! I spent Saturday in the hospital ... some complications in the incision from my recent surgery, and saw the doctor today, and he wants me to see the surgeon tomorrow, as there is a questionable sore spot developing on my upper right side, and they aren't quite sure what it is. I'll hopefully find out soon. I hope this finds one and all healthy and happy. Hello to all. I cannot believe that it's already the end of April ... and summer is fast approaching! Shawn and I set up a time to meet Grandpa and Shawn's dad, Larry, at our lake lot last weekend. Also in tow were my mom, Caity, Caity's friend Kirsten, and Jayce. Grandpa has graciously agreed to be our Lawn Maintenance Supervisor (and crew), so he wanted to get a look at the lawn equipment (riding lawn mower) and wouldn't ya know it ... he was able to start it right up! He also gave us some nice lake home gifts: screwdriver, hammer, pliers and a few more things that I'll most likely never use. That's all yours, Shawn! ;-) We were also able to assess the amount of work it will take to get everything else up and running and docks and pontoon in the lake. We plan to do that on April 29th-30th. We are excited beyond belief! We would like to thank our helpers that day. First and foremost to Grandpa for agreeing to help with yard work and also Shawn's dad, who will be instrumental in helping us get the dock, pontoon and everything else ready for the summer. Caity and Kirsten pulled up plastic from the floor of the trailer that had been put down by the previously owners while they were showing the property and Caity vacuumed up any messes using our new mini Dirt Devil vacuum, which worked slick. Mom helped me do some clean up and get the place freshened up. We opened all the windows to air it out and used air fresheners on the carpets and set some out to keep it smelling nice. The previous owners took great care of the trailer, so we are lucky to have a nice place to stay while we enjoy the lake. We hope to build at some time in the future. 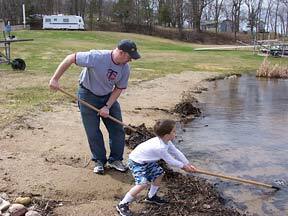 Jayce was also a big help -- he dug right in with Shawn on cleaning up the shoreline! Shawn & Jayce clean shoreline, left; Shawn & Lori, right. Please change our email to husebys@hotmail.com as of today. Our new phone and address will be effective on April 26th. P.S. Please do not forward jokes and other such email messages to our hotmail account -- I won't be able to check it as often and this account gets a lot of messages. Thanks. 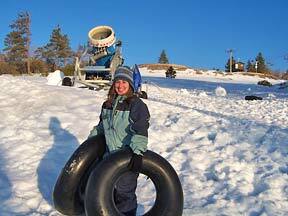 Lori Anderson ready for tubing, left; Keith Mason's snowman has pine cone arms and a face made from pocket change, right. Keith and I haven't had much for news lately. 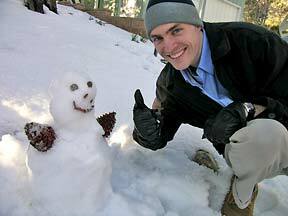 But we thought it would be fun to let everyone know about our vacation to Big Bear Lake (which is about a two-hour drive northeast of our house to the San Bernardino mountains). We had one goal in mind -- to see snow! Orange County seems to lack the fluffy white stuff. The mountain area is really popular for skiing and snowboarding, but we decided to explore the neighborhood where we rented a cabin, as well as the shops and restaurants in town. UPDATE -- Rylie gets published! 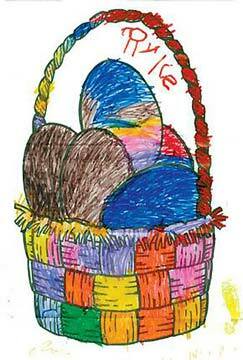 The Fargo Forum had a picture of an Easter basket a couple weeks ago for kids to color and send in. Rylie did one, so I sent it in, and it was in today’s paper! It was like she knew she had to be careful; this was the best I’ve ever seen her color! Rylie's Easter Basket, left; Dorothy's Easter Basket from Caity & Jayce, right. Click here for a fun feature on Easter Egg creations. A link to "more photos" at right on that page will get you the 13 division winners. 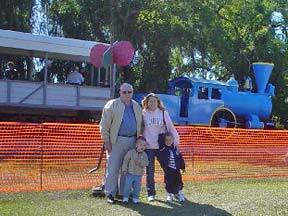 on "The Little Engine That Could"
Just a few miles away from where I live is the Florida Railroad Museum. One week in our little local weekly paper was an ad for a once a year event ... the weekend stay of a blue steam engine called "The Little Engine That Could." 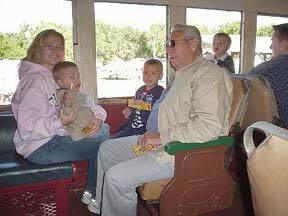 So Kelly and her boys, Nathan (4) and Devon (3), Great Grandpa Miller and myself decided to take a train ride. It was a beautiful sunny day with just right weather. We had real train tickets, we were ushered onto the train by volunteers wearing authentic uniforms from a time long ago and enjoyed the vintage appointments of the old time train cars. It appeared to be sort of a combination of eras, but was a delightful step into the past. I thought it would be noisy ... goes to show what I know about trains ... but it was amazingly quiet. As there is just one straight stretch of track, we backed up for 1/2 hour, then went forward for 1/2 hour. The boys loved it! After our ride we also got to climb in and explore a red caboose ... what fun! Then we all went to the Sleepy Hollow restaurant for a Deep South style lunch ... no one tried the okra ... but the southern style homemade potato salad will certainly justify another trip there. Jim Miller, Kelly Seaman, Devon & Nathan ride "Little Engine That Could." 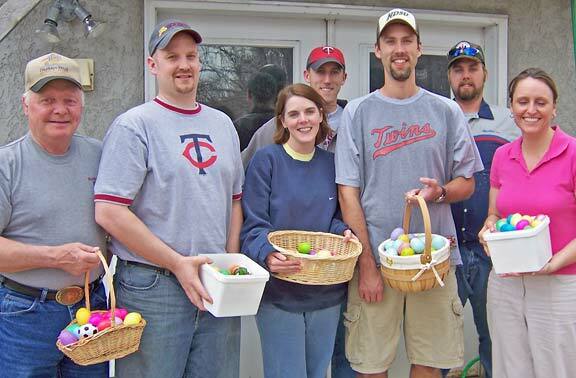 "Easter bunnies," left to right: John Thoennes, Shawn Ostendorf, Jolene Johnson, Weston Johnson, Wyatt Johnson, Ben Johnson, Lori Chap. We had our annual Easter Egg Hunt at the farm on Saturday. After some discussion, we feel it may have been our 10th, but I am not sure. It's for sure been at least 10 -- which means, at any rate, it's been a few! The weather cooperated, and as they'd predicted showers, we were happy about that. It was a dry yard, meaning that eggs were hidden far and wide by the "bunnies." Gave the six children involved (Grant and Vincent Finkelson, Rylie and Brooklynn Johnson and Caity and Jayce Chap) ample room to hunt eggs. They each got quite a huge number. Tthere were probably enough eggs hidden to keep ten more kids happy! One of the "bunnies" had hidden quarters, dimes and nickels in the plastic eggs, along with candy. Made for some happy hunters. 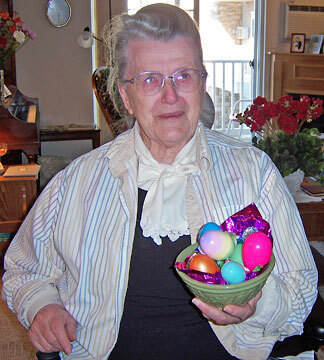 There were two dozen eggs boiled and ready to be colored, once they were back in the house. That's always a fun process and each got to do a few, which means we'll be eating eggs for a while! We ended the afternoon with grilled steaks, baked potatoes (sweet and regular) salad, mushrooms, cheesy garlic bread, and for dessert: Dairy Queen cake. 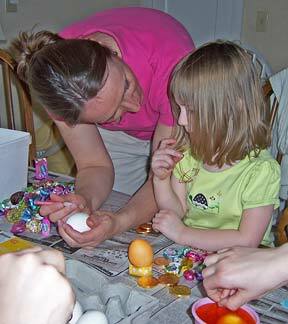 Egg hunters, left; Lori Chap helps Rylie Johnson color Easter eggs, right. 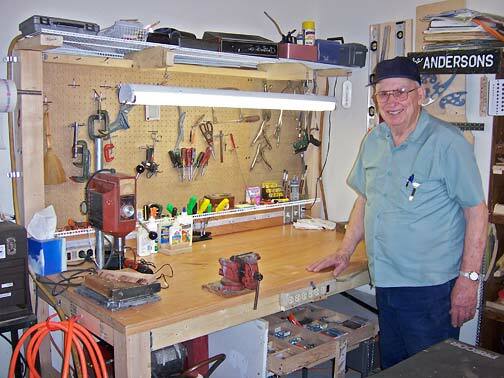 Don shows off new workbench in garage workshop. 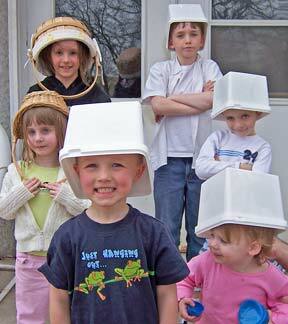 Beaver, Caity, Jayce and I visited Mom and Dad with an Easter meal and a very little Easter "basket." We had grilled steaks, sweet or regular baked potatoes, mixed veggies and a salad. After we'd eaten, we got the tour of Dad's garage to see his new workbench; it makes an awesome addition to his workspace! We also admired the many benches he's made; they look great! Here is my guess: Duane Miller's granddaughter Abigail [Kraemer] is the one doing the coloring and the other little girl is the Photo Editor's grand-niece (I think). Is it Ashley Huseby? Photo Editor's Note: At The Bulletin, sometimes even the editor doesn't know for sure ... but the former school teacher got 100% on this week's quiz. Go to the head of the class! And ... I wanted to guess last week ... of course I knew it was you [Dorothy] and Aunty Gert ... but wanted to thank you both for giving us such attractive genes! What charming pictures ... wish we could have been teenagers together. Editor's comment: I saw Penny all over again when I saw the picture of the little coloring blonde -- and both Gert and I look like the generation before us -- isn't it all amazing? Editor's Note: Larry Dake was still undergoing treatment for an eye problem this week, so no LTD Storybrooke but he will send us another chapter as soon as he can. We wish him a speedy and complete recovery. I continued to attend the one-room school during the winter months until I was eighteen years of age. My mother was determined that her children were to have as much of an education as possible, but my father was not concerned about it at all. 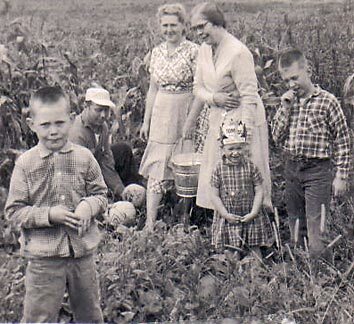 Mother managed to arrange for my two sisters and myself to continue on to school in Fergus Falls, which was a distance of about twenty-five miles from our farm. The girls would get to start at the beginning of the term and remain through to the end. I had to remain on the farm until all the fall farm work was done. Then, when spring came, I had to drop out from school in order to help put in the crops. That gave me somewhere from four to five months in the middle of each school term. I spent a few months in the seventh grade in Fergus Falls and the following year was admitted to the eighth grade. I was eighteen years old by that time, and Amelia, two years younger than I, was well along in high school. We rented rooms and boarded ourselves. Most of the produce we needed came from the farm. My mother made many long, hard trips to keep us supplied. The only method of transportation was by team and wagon. In order to earn money to help out with expenses, I used to spend Saturdays sawing wood that was used for fuel. I would saw a cord that came in four-foot lengths into three pieces, for which I was paid from forty to fifty cents. With a hand buck-saw it was an all-day job, beginning at daylight and lasting until dark. After spending half sessions for two years in the eighth grade, I was pronounced eligible to enter high school, but I never did. My two sisters did and graduated with honors. A small business college had started up in Fergus Falls, and my father decided that was the place for me. I wanted to go to high school but was compelled to spend two short terms at the business college. 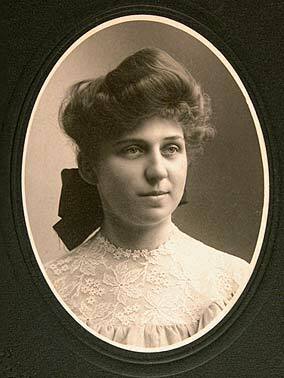 By the time that was over, my sister Amelia had graduated from the high school [in 1904], and with the help of my mother, I was permitted to go with her for a short summer session at the normal school [for teacher training] in Moorhead, Minnesota. We again rented rooms and boarded ourselves. By the skin of my teeth, I did get a credential that permitted me to teach in a one-room, country school similar to the first one I attended. Graduation pictures, 1904: Amelia Miller, left, Edward Miller, right. 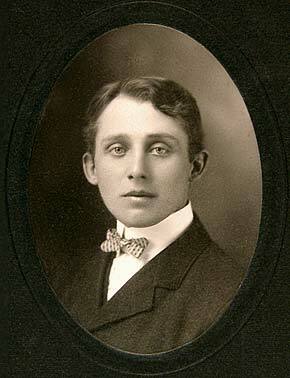 Amelia graduated from high school, Edward from business college, in 1904. 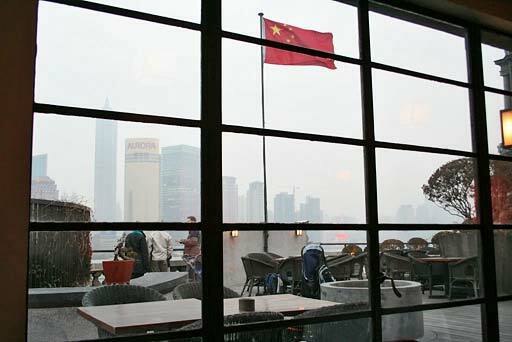 Chinese flag from balcony at The Bund. I got two more wooden combs, for cheap (10RMB and 8RMB), and some petroleum jelly. Then I found the section with the New Year's decorations. I ended up buying several of those, as we'd talked about taking some home for the house. I got mostly ones with a fish motif, some in knotwork and some just stuffed cloth. I got a few small ones that I thought would be good gifts for the kids, too. One thing that happened to me for the first time at the New Year's decorations, that startled me at first but not terribly so, was a woman, a fellow shopper, coming over to my shopping cart and taking one of the bigger decorations out and looking at it. It was quickly apparent that she was just admiring it, as she put it back and smiled at me and walked away. This happened twice more before I left the store, but I was more prepared for it. Someone in the states might have gotten punched for doing that! When I first got to the second floor, I looked at shoes, as I don't have any good walking shoes; my Nikes wore out months ago and I never got around to replacing them. I ran into the same problem as with clothing -- they don't sell size 9-1/2 in China. The largest I found, I think, was 7 women's. I looked at men's, thinking I could get some men's 7-1/2 that might fit, but there weren't any that I could find. So I'll make do with the shoes I brought along, I guess! I went to the electronics section, where I looked briefly at a portable DVD player, as we'd talked about buying one for while we're here, so as to not have to change over our laptops for local movies. They started at around 1,600RMB or $200. But we'd watched no movies since we got here, anyway, so we later decided not to bother with it. Then I went to look at some cheap, small headphones, as Greg had been taking my iPod headphones to work so he could listen to music and not be so bored all day, once he finished the day's work. While I was looking at the earphones, a young Chinese guy that I'd seen when I was looking at the DVD players came over and asked if I was looking for anything, in pretty good English. I had already picked out the headphones I wanted (for 7RMB, cheap!) and said, "No, I just need these." He didn't look like a Wal-Mart employee; he was wearing a nice black sweater and blazer, jeans and black dress shoes. Come to think of it, he looked kind of like a gangster from a movie! Anyway, he then said, "My company has a special promotion; you buy DVD player we give you free headphone. You come with me when you leave here and I'll show you." I just said, "No, I don't need that, thanks." So the pushy salespeople were even in Wal-Mart. I knew then he wasn't an employee but someone targeting foreigners. I didn't get the feeling he was trying to kidnap me or anything bad but really was trying to sell me stuff. When I said, "No, thanks," he went away and I didn't see him again, so he took no for an answer the first time, unlike the people with the booths at Xiangyang. Since a few weeks we have new clothes at work. Almost five years we had orange and green as colors and that has changed now into apple green and yellow. We are very happy with the new outfit and it looks much brighter, as you can see on the picture. The picture was taken in front of the shop on a Saturday after work. 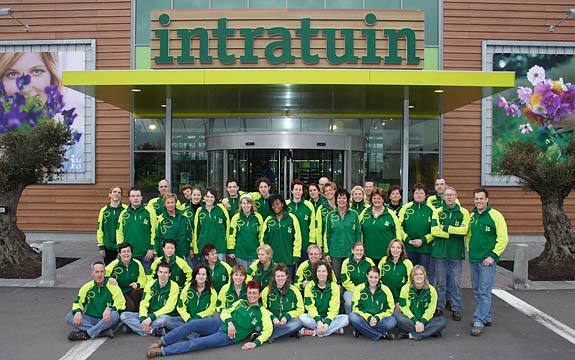 Almost 25 people are missing on the picture; you can see we have a big team to run the garden center. You can see me in the picture in the front row at left. 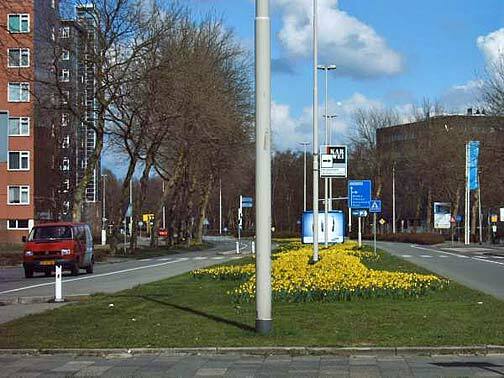 Also, good news about the weather in the Netherlands, spring has finally come and temperatures in the weekend will be above normal. This will bring many customers to the garden center to buy products for their gardens and balconies. In the house plants it's not busy at the moment. On Sunday, April 23, we all go to a musical in the Royal Theater Carre in Amsterdam. We leave at 4 p.m., have dinner first and after that the show. We go by bus and will be back around midnight. Will tell you more about this business trip later. Nature is beginning to look green now, trees are getting leaves and many flowers all over. Mitzi & Sheldon share a piña colada served in a pineapple. The idea of "a beach and a book for a week" began when Frontier Airlines sent an e-mail about cheap fares to Mexico. It was just a minor inconvenience that we'd have to drive to Denver (600 miles) to catch a direct flight to paradise. Sheldon arranged for the services of our nephew Chris Swenson to stay with Tyler and Aunika and we were on our way. Driving through sleet and snow occasionally on the way to Denver made the thought of a sunny, warm beach especially inviting. We arrived in Zihuatanajo, Mexico, early in the afternoon. A short taxi ride brought us to the bungalow we rented over the Internet, Casa Lagartija. We wondered if we would be miserable without air conditioning, but found the weather to be perfect! Most of the windows didn't even have screens, let alone glass, because there were no bugs this time of the year. It was sunny and warm during the day and cooled off just enough in the evening to be perfect without needing a sweater! We planned to be lazy. Every day we ate breakfast on our patio, walked downtown and used the Internet for 30 minutes, and then went to a beach for the rest of the day. Reading books and watching the people were our activities -- I read a complete book every day:) We knew if we had friends or kids along we would not be spending all day lounging in chairs, so we savored the chance to relax. 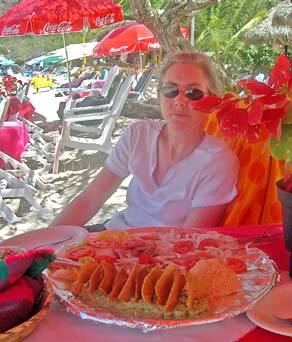 Lunch on the beach was always guacamole and chips, maybe with beans and rice, and sometimes grilled fish. One day we shared a virgin (non-alcoholic) piña colada that was served in a whole pineapple. It was the life of leisure. 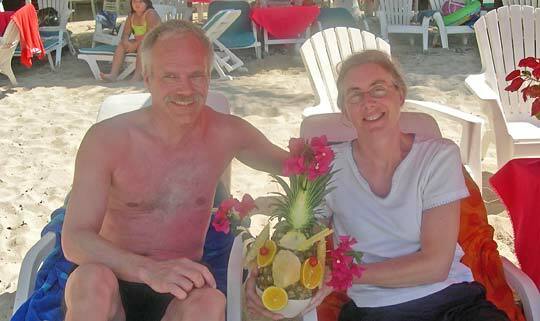 One day we took the bus to Ixtapa, about five miles away. After walking to the marina we ate lunch and found the beach for the remainder of the day. 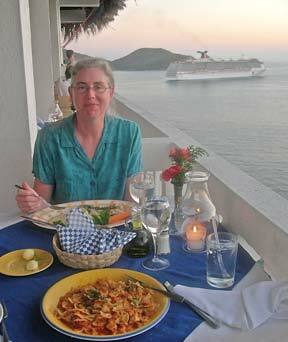 Every evening we ate a delicious dinner of seafood, generally in a restaurant outdoors, sometimes without a roof. This was the most relaxing vacation we've had in years. It will take weeks of exercise to undo the effects of a week of "a beach and a book for a week," but we highly recommend it to everyone! Here's a link for more information. Mitzi dines al fresco, left; lunches under red umbrella, right. The word Sudoko was touched on in several Bulletins recently, and it caused me to wonder if there are others out there who enjoy doing those puzzles. My first encounter with one was a book that Muriel had purchased in California, while visiting there at Christmas time. It had just reached a craze there then. The book didn't strike me as something I could learn to do, but after looking at it a few times, I learned how to do them and have found them interesting and challenging. Sudoko puzzles are time-consuming pastimes, just as crosswords or jigsaw puzzles are. One can find the puzzles in most daily newspapers, or in books in drug, grocery, or discount stores. They all vary from simple to very difficult. To do the puzzle, one must put in numbers from 1 to 9 in vertical and horizontal rows so the same number does not appear twice in the same row. One does not guess at which number goes in which space, but rather there is reason why only one number will fit in that particular square. Doing a Sudoku requires logic, skill, and deep thinking, yet it is addictive and challenging. 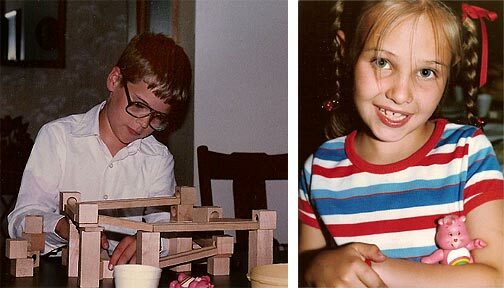 It is said doing such games and puzzles helps keep one's mind stimulated and actively working. Are there others of the subscribers of The Bulletin who do them? I think I will go and do one right now -- if I can remember where I put my book! 1 lb. chicken thighs without skin, boneless, cut into 24 bite size pieces. 1. Combine first 6 ingredients in a small saucepan. Bring to a boil and cook until reduced to 1/4 cup (about 2-1/2 minutes). Remove from heat and cool. 2. Combine soy sauce mixture with chicken; cover and refrigerate for 1 hour. 3. 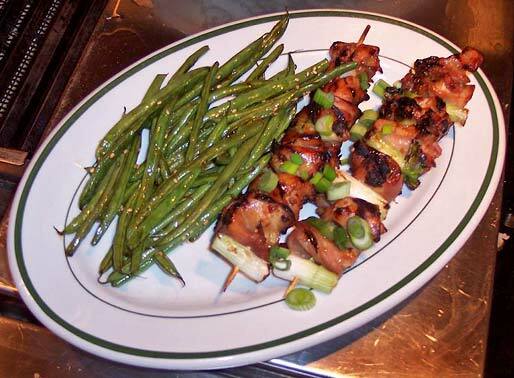 Thread 6 chicken cubes and 5 green onion pieces alternately onto each of 4 skewers. Brush kebobs with remaining soy mixture. 4. Grill over high heat until done -- about 4 minutes on each side. Chicken Yakitori Yield: 2 servings (2 kebobs each); 306 Calories, 6 W.W. points per serving. Just a little line to tell you about a surprise special visitor to the Droel's yesterday: Virginia Adair. She had stopped in on her way from the dentist, and left off a small platter she found that I had been looking for but never could find. I was thrilled. Of course we chatted Bulletin, and about her friend and shadow, Bitzi. We were talking about Jack and his love for guitars. She had on a new jacket she had just finished in her quilting world. She spent some days at a quilting retreat with her two daughters. Sounded like a truly special time together. Seems our conversation always drifts to The Bulletin world! NICE. EXTRA! Keith Mason & Lori Anderson find Troll at Big Bear Lake! Congratulations on your 200th Bulletin! It’s a joy to read each issue. I'm really enjoying "going back in time" with the Edward Miller stories! I've always enjoyed reading of that era and to have it be by someone that lived in the Ashby area makes it even more interesting. Also can you imagine having a seafood department in our Wal-Mart like Sonja described? Wow, talk about fresh, is right! Although the unwrapped other meats would not be very wonderful. Yummmm, going to get the fresh ginger root and try out the stir fry recipe, looked delicious! Good tip to keep the ginger in the freezer! Hi! -- very nice! Funny to read my own information, though, as I don't talk about myself much. 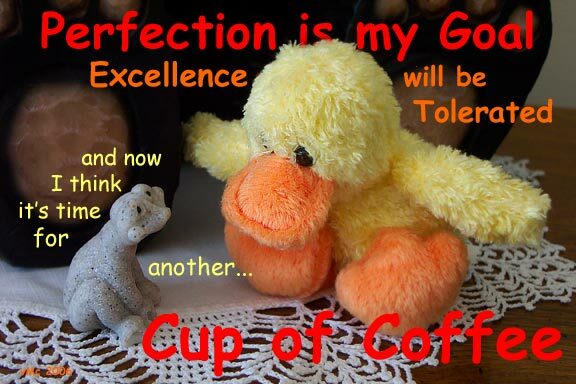 :-) The picture was perfect -- am still looking for some you might use sometime -- from the "olden days." What a surprise to see Jess Cloyd's name in the birthdays! Haven't heard a word about him/them since they left Arizona! I hope they are doing OK. Do you have an e-mail address for them? Thank you again for letting me in on this very exciting publication! Do you like? want? information every once in a while? I haven't quite figured that out yet. Editor's Note: We are glad to have you on the mailing list and we are very pleased that you find the paper interesting. All of those who write to us help it to be lively and interesting. And yes, we will be hoping to hear from you again. Imagine! Bulletin #200. Am sure you never thought ahead that far when you were writing Bulletin number 2.... Congratulations for such a thriving growing Bulletin. I am so glad to be a part of The Bulletin world. Thanks for including the Droels. I spent way too much time just looking and looking at that beautiful White Amaryllis blossom on the first picture. On the screen it shows up so clear and big, with the little details nature put into that unusual, pure flower. Thanks, Jerrianne, for your expertise in taking those pictures and sharing them. The Update of Coni, and Weston was welcome again. We have gotten very involved in their progress, as The Bulletin keeps us informed to where we feel we know them, too, although we have never met them. Their plight as a young couple with so many prospects is what touches our hearts. Our son, Darrrel and his wife, Johanna, write about the cherry blossoms in DC where they live, so we loved seeing that picture taken of Coni and Weston with them. Diana must have put forth a lot of effort to write that update for The Bulletin. We know she must not be feeling very well, but somehow The Bulletin draws out our best efforts. Fun to watch as our little girls become older girls with different interests, etc. The story of the Mall trip and the Victorian pictures will be a treasure in a few years. I was positive that was DUANE MILLER on the photo by Donna Johnson. He has not changed that much since a young boy, and I was very interested to see his children and to hear about his life's experiences through the years. Rosanna definitely has Miller eyes ... I thought of Jim right away when I saw her. The Miller family: Duane, Jim, Blanche, Marjorie Olp, Sharon, Steve. This picture is what I mean ... when I remember him best. Also Sharon and Steve. 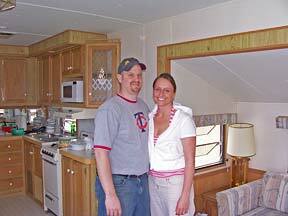 Fun to see the picture of Donnie, who has lost so very much weight, and Shari does not change much. I was extremely interested in what Carol Printz mentioned about Charles Goodnight. He was someone mutual friends knew, and we visited his museum and grave. He became a part of our faith in the years before he died. My mother was so enamored by his life's experiences that she kept everything in reference to him over several years. And now you have met my sister. My only sister! She lives near Phoenix (Apache Junction), as you read. Ruth Kitto. Her husband is a full fledged cowboy with the cattle and roping and branding, but now is retired, so moved from Montana to Phoenix. Quite a contrast, I'd say. We loved every single picture of our Matriarch, and I'd say she looked excellent for turning 80, after the struggle of having to put up with the effects of polio through the years. She was very deserving of such a grand celebration. She is loved by us all. Hopefully, Larry is improving from this serious eye condition. We patiently wait for whatever he can share with us again ... we miss the LTD Storybrooke. The A Long Time Ago by Edward W. Miller was interesting again. I'm glad there were some scribes in that relationship to update us on the Good Old Days, and even the present ones. Every chapter of the Shanghai experience makes me more thankful for our life in USA. Noise, smell, danger, customs, mobs and mobs of people ... 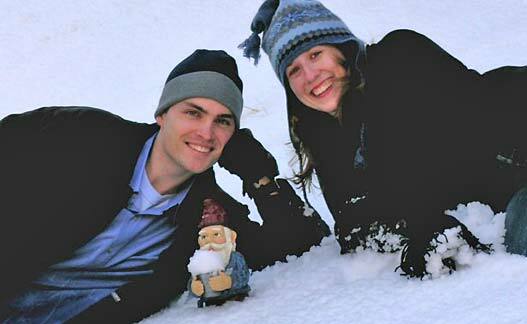 I'm too old for that, but am sure it was a trip of a lifetime for Greg and Sonja. Skinny Recipes from Donnie are genuine and authentic, when he has accomplished such a fantastic weight loss. Let's hear it for the WINNAH!! April 23rd is soon here, when we get a detailed update and pictures of Miss Kitty turning 3. Not everyone has a hand carved sign held by a bear ... Guess you have to reach 80. The Miss Hetty letters let us in on a lot of day by day comments of the readers. It's disappointing if there aren't any. I love re-reading The Bulletin and being able to express all the feelings I have as I do. But, remember, if this is too long or dull or anything, please feel free to edit it right down to the bare bones. Bitzi creates inspirational poster to keep The Bulletin staff awake.